There is nothing like a long road trip to make me feel like I am truly exploring an area of the world. This is not always possible as one is traveling the world, but now that we are semi-permanent residents of Thailand, and have a car, we are embracing this way to travel the country. 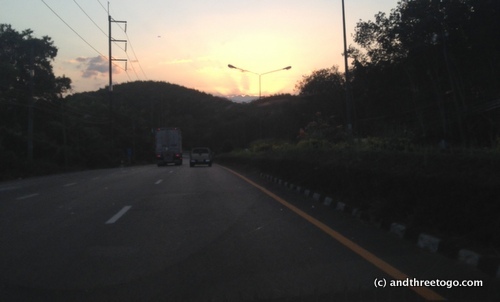 The first road trip we took was a shorter one to Krabi, about a three-hour drive from Phuket. Then we graduated up to a much longer one over two days to a whole other country, Malaysia! It has been a long time since our visa run to Penang, Malaysia. In fact, last year we did very little traveling, we have been settling into our home here in Phuket and Chad has been working hard at bringing amazing craft beer to Phuket. Not surprisingly, beer is popular here in Thailand and American craft beer is on the verge of exploding so Chad has been quite busy. Chad is responsible for the craft beer distribution in the southern part of Thailand, which includes Hua Hin. So the day after Christmas last year (it sure feels weird saying that already) we took the opportunity to make one of his sales calls a family road trip. Woo Hoo! We left Phuket a bit later than we had originally wanted to, but still early enough in the morning to skirt the usual traffic on the road here. The hour it took to get off Phuket island seemed to pass without much thought and once off the island, the greenery and limestone cliff mountains reminded me that we truly live in Thailand. It can be easy to forget when you spend most of your time in Phuket. Phuket is awesome but very different from the rest of the country, it is more transient and tourism-based which has diluted the culture a bit. The roads were smooth and new for the most part. Which made the 10-hour drive comfortable and fun. We stopped along the way a few times for bathroom breaks and snacks at rest stops that have it all. The rest stops are actually gas stations that are surrounded by a coffee shop, restaurant, clothing or souvenir store of some kind, and a 7-11. They also have many photo opportunities which are a great way to get your pre-schooler to run around and stretch their legs. I was able to make a whole slide show for you of pictures we have of Z at the rest stops. 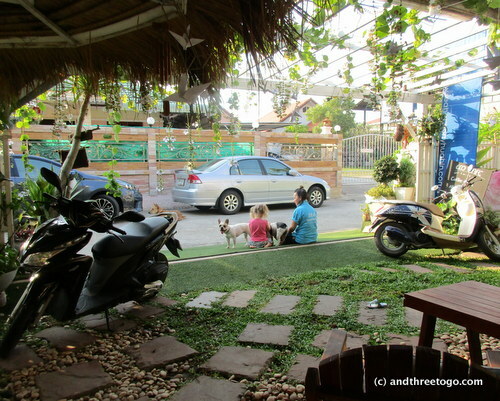 We arrived at Sea Harmony Eco House in Hua Hin around 9pm. We were so happy to see our friends Node and Indy again. ANd their pups Pela, Kascha, and Chaba as well. It was like visiting family. They were our only friends when we lived in Hua Hin and are truly our adopted family. We love them. Z and Indy chatting and catching up. We were exhausted. It always surprises me how tired I get sitting on my rear end all day. We turned in early after having a lovely dinner at the Eco House of Massaman curry and chicken satay. All three of us were so excited for breakfast at Sea Harmony, we jumped up and got ready as quickly as we could. In fact, I don’t think I have ever seen Chad hop out of bed so quickly in our 9 years of marriage. You would understand our hurrying if you could taste the Issan Breaky that Node and Indy make in their cafe. And their coffee… oh man, my mouth is watering just thinking about it. Look at the presentation of my latte. Gorgeous and the elderflower infused water is a great way to start the day. After eating breakfast, we went to the mall… I know, yuck! There was a reason for it, though. Chad had a meeting about beer there and Z and I needed to run around a little after our long drive the previous. So she and I headed to the Kidzoonia playground on the top floor while Chad went about his meeting. After Chad’s meeting was done, he came and suggested that we go bowling. Z had been asking about going bowling for months, but we hadn’t had a chance until right then. We took our opportunity and it was SOOOO fun! I didn’t realize that bowling could be so entertaining until I watched Z’s little face as her bowling ball slowly (very very slowly) rolled down and hit the pins. It was a full-service bowling alley too, they served us our shoes all cleaned and prepped with new socks on a tray at our lane. They also had a full menu, which we were still too stuffed to utilize, and anytime there was an issue with the ball return thingy (that’s the proper term right?!) they were there before we could even notice it. It was a great time! I tried to get some pictures, but they were all blurry because of the strange lighting. After I won at bowling (hee hee) we were on our way to the outskirts of Hua Hin to a place called the Palm Bistro. We were planning on having lunch there before Chad taught the people working there how to clean their draft beer keezer that was serving the amazing American craft beer Chad distributes. The owners of Palm Bistro, Steve and Jenny, were at the restaurant when we arrived and invited us to sit with them and their twins that were just Z’s age, what luck! We spent the whole day eating and chatting (and drinking beer of course) while the kids played. It was my first time having a British Sunday Roast and Yorkshire pudding and I am now hooked. I am actually glad that we don’t live in Hua Hin, I have a feeling that I would be needing to buy larger clothing. Did you know that Yorkshire pudding is not actually pudding but an amazing savory soft fried bread? You must try it if you haven’t already! Monday morning we were up early again for another delicious breakfast at Sea Harmony and then were on the road again. The 10-hour long car ride home was punctuated by a gorgeous sunset which I tried to get a proper picture of but it does not do it justice. We made it back to Phuket safe and sound and ready to plan our next trip, Bangkok! The sun falling behind a hill highlighted by clouds. What do you like to do while on a road trip? Drive straight through or leisurely stop at all the sites along the way? Have you ever had Yorskshire pudding? Leave a comment and lets chat! I agree, a long road trip has a way of making me feel like I am truly exploring the world. Your adventure sounded wonderful! Thanks Kim! I would love to do a road trip around the world… Over like two years though haha. Road trip! Love road trips. What a nice combo of work and play. Woooohooooo! Your post brought back many happy memories of my first trip to visit you three. I so enjoyed the tasty food and beautiful presentation as Sea Harmony and I too thought Node and Indy were fantastic. They loved Z so much we had much in common! It depends on what type of trip I’m taking as to whether I want to be a tourist and enjoy the sights or just get there. I do rather enjoy taking in the little shops that have unique products from the area and have often found you can get a “picture” of a town when you stop at the local gas/markets. I do so miss the pork buns from the 7-11’s there! Z looks adorable with all the characters. Your trip sounds so fun. How nice to have a short holiday after the holidays! When on a road trip my favorite thing to do, now that all of our kids have grown up, is to listen to books on CD or podcasts. You know you’re old when….. No, actually, never was a music listener so I’ve been this weird since birth. tee hee I do miss the days of Adventures in Odyssey though. They entertained young and old alike. So love the blog and photos! Can’t wait to read the one for your trip to Bankok! I was just telling chad that I wished we had Odysseys! And I also love podcasts, so it’s not your age silly. Sounds like a great little get away! And yes, definitively stops on the way, especially when travelling with children. The good thing with them is that there doesn’t need to be anything special for them to have fun on a break. Just a bit of space and creativity! 10 hours in a day a lot though, even for me! It was a really long day, but with the stops and the iPad it was fairly simple. Z was a complete champ! It all looks like a wonderful time together. I miss those kind of trips! My mom made Yorkshire pudding with a roast beef a few times when I was young, and I absolutely adored it. I can still remember how exactly how it tasted. I’ve considered doing it myself, but it looks like an awful lot of work! The part where you mention it takes 3 hours to drive to Krabi just kills me. I miss that place so much!! This sounds fun! The breakfast photos were so great looking! I hope you and Chad are finding more time together despite his work–sounds like he’s busily blessed! Okay. My favorite today? 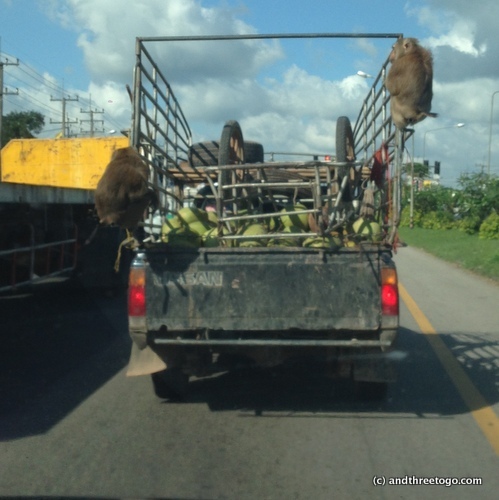 The monkey on the truck. Great trip!! Yeah for Chad doing this beer thing! Great photos as usual. Zee is growing so fast. The photos don’t have to be perfect to create a good effect on us viewers. They are a window into your world. I really really love audio books while driving around. Won’t leave home without one or more on long trip. I like easy, fun listening stories. Janet Evanovich’s Stephanie Plum series is my current fave. It is about a female bounty hunter in New Jersey who keeps her gun in her cookie jar…..lots of laughs. I will definitely have to look those books up! I am always in search of new authors to check out. I listen to podcasts all the time now and will probably be starting audio books when z gets older. Then she and I can listen to classics like “Alice in Wonderland” together. It is so difficult to take photos and stay present in the trip. I try, but need to work at that more. In both ways haha! Thanks for commenting! It always amazes me that children seem to like bowling an awful lot lol. A few years ago, we offered our then 11 year old son, a choice as to how he would like to celebrate his birthday, and this is after we’ve done theatre, choreography and a hip-hop dance group, rope-climbing in the forest, a treasure hunt in a national park, etc. 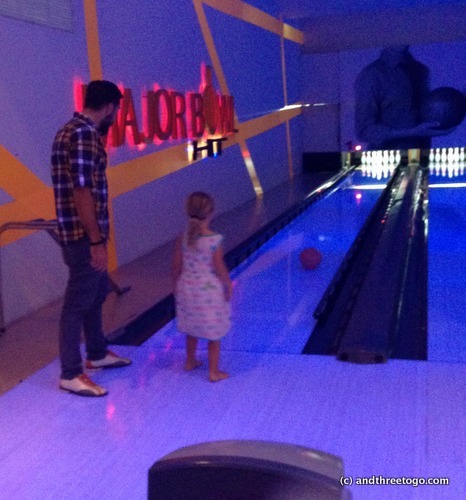 He chose bowling lol! Victoria@ The British Berliner recently posted…15 incredible reasons why you should visit Bath in 2016: Heigh Ho!